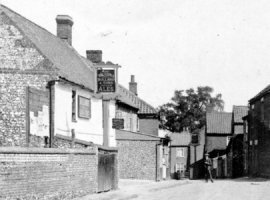 Anna Allen, second daughter of licensee James Allen, married Mr. Richard Neville, late valet at the Lamb Inn, Ely, on Wednesday 8th December 1847. The VICTORIA with the sign of the BRICKLAYERS ARMS visible in the distance along the Stanhoe Road. The name KING WILLIAM was allocated to the new house built on the site.